In the early years of the twentieth century, the period in which A Tale of Two Sisters is set, a stereotype persisted in Europe that Turkish wives were slaves and chattels. The truth, however, was very different since the legal status of Turkish women was, in fact, better than that of European wives. The Turkish wife had absolute control of her property and the law allowed her to do what she wished with it – either on marriage or if she later inherited . And she could act independently of her husband, maybe sue in court, be sued herself, without regard to him. 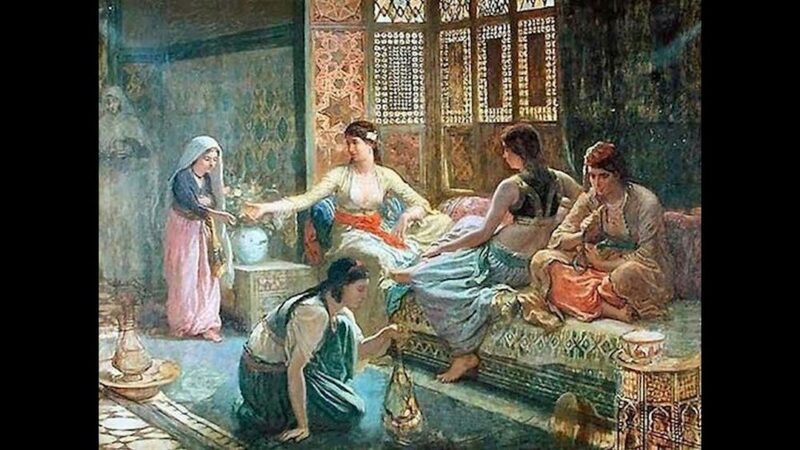 Within their own homes, Turkish women had absolute sovereignty and were treated with courtesy and respect. Outside the home, they were similarly respected. It was considered a sin to stare at women in public, for instance. And if a man behaved badly towards a woman, regardless of his position or religion, he would not escape punishment. 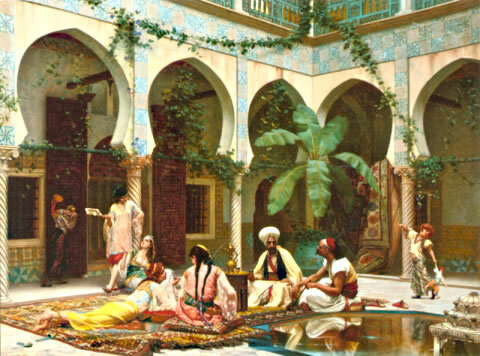 The harem was a sacrosanct space, not just a place where women were guarded, but a place of retreat to be respected. 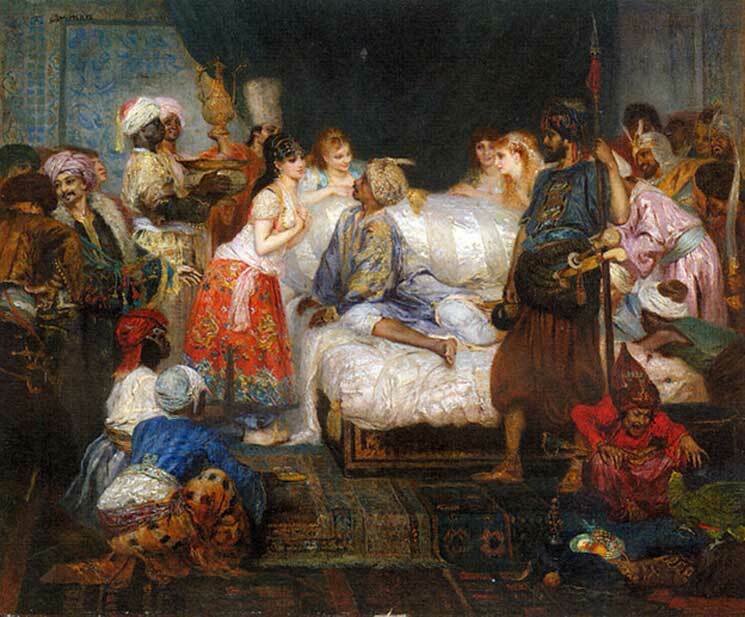 The word ‘harem’ actually means sacred or forbidden and did not only relate to a female space. (In Ottoman usage, for instance, the inner courtyard of a mosque was a harem) Within this sacred space, a husband had the right to enter the apartments of his wives at all hours, but rarely availed himself of the privilege. The women would resent such an intrusion. Instead, one room of the harem was kept for the master and it was here he would meet his chosen wife. Lydia, one of the two heroines of A Tale of Two Sisters comments ironically on the fact, an irony completely lost on her Turkish companion. Female and male parts of the house were therefore clearly demarcated. Children mixed freely with adults and were included as a natural part of harem activities, with Ottoman women being devoted mothers. Victorian female visitors, accustomed to children being kept in totally separate quarters, often concluded that children in Ottoman families were overly indulged. Young boys remained with their mothers in the harem until they were seven, then would begin to participate in male company in the semalik, the male portion of the house. 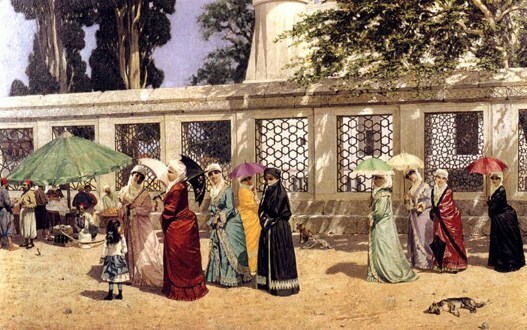 Girls remained in the harem until they married and took on the responsibility of running their own households – from childhood they were trained to be wives and mothers. Good manners were prized in this society and personal cleanliness,too, was seen as essential. Baths and hammams abounded and the harem itself was clean and orderly. Wooden floors were covered with carpets beaten daily, and the rest of the house scrubbed every week. No dirt, dust or foot mark was allowed – every man and woman, regardless of rank, would take off their outdoor shoes for indoor slippers. The cleanliness and order of the imperial harem is one of the first things that strikes Alice, one of the two heroines of A Tale of Two Sisters. 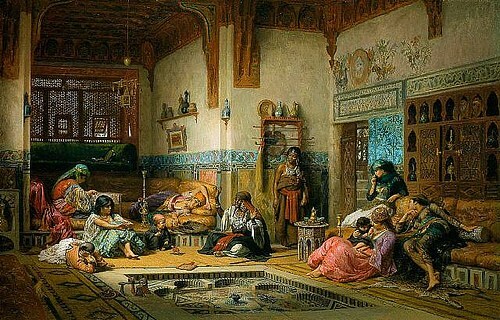 The harem itself was a collection of spacious but sparsely furnished rooms. There was a large meeting room in the middle, with smaller rooms branching off – this was the anteroom where the women socialised, along with their female guests and female slaves. A gallery bordered the whole, with windows most often looking out onto the garden. Any windows that faced the street were covered with latticed shutters. In the homes of the wealthy, marble fountains were sometimes found in the anterooms. Furnishings consisted of built-in sofas or divans, wooden platforms raised off the floor, often on three sides of the room. Elegantly designed cushions made from silk and brocade, or embroidered with gold wire upon white satin, provided the seating. A fourth wall might contain a large cupboard where bedding was stored during the day, together with shelves to house water pitchers, sherbet goblets etc. Wall hangings were largely absent – perhaps a few framed yaftas or texts from the Koran – or the rooms were wainscoted with cedar or painted with flowers. By the end of nineteenth century, European influence saw chairs begin to appear, along with the odd console table and mirror. It made for an eclectic mix. At meal times slaves delivered various dishes of food to the anteroom and would collect the trays later. In winter, the room would be heated by a brazier, resembling a short round table in which hot ashes were emptied and then covered with a large cloth. People would sit with their feet under the table and as much of their bodies as possible under the cover, to keep warm. Harems were thus gregarious and social places. All the women and young children of the house lived and worked together, including the mother-in-law if widowed, and sometimes aunts, and numerous female slaves. Large harems could have up to a hundred slaves to perform daily household tasks. In addition, female friends, relatives, neighbours, were always welcome. Ages, races and statuses mingled but a strict etiquette was observed: the mistress and distinguished guests sat on the sofa, women of lower social status at a distance on cushions on the floor. If a mother-in-law lived with her son, she headed the social hierarchy, in imperial as well as household harems, and was held in the highest esteem and shown great deference. A wife could not seat herself before her husband’s mother has taken her place, could not be the first to help herself to dishes etc. The mother-in-law had the final say in all matters relating to the harem and oversaw its daily functioning. The role of the Valide Sultan in the harem of Topkapi Palace is simply a larger and more prestigious example of this unwritten law at work. Women spent virtually all their time within these rooms. If there was a garden, the women would walk there regularly though always with a companion. If they went out publicly, it was with another woman or with one of their female slaves. Only elderly women could go alone! And so a natural modesty was assured. If a woman’s behaviour aroused the slightest suspicion she might be unchaste, she was despised and her husband and family humiliated. Even neighbours would feel their honour tarnished. It’s clear that the stereotype lodged in the European mind was a long way from the truth!